With extensive research and development, we journeyed into creating solutions that could optimally cater to diverse skin types. Our range of unique blends in 15 shades was created using the finest naturally derived botanical and certified organic ingredients. TechnoTan solutions do not contain parabens, mineral oils or sulphates, we create quality products that’s beautiful for the skin and the environment. A brand that your clients will love time and time again. 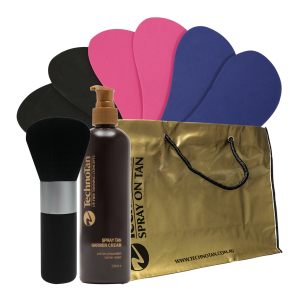 In complimentary to our spray tan solutions is a selection of compressors, application guns, spray tan tents, booths, pods and tanning accessories. We also offer a range of services to support your spray tanning business such as: marketing support and training, to bring your business the exposure it deserves. With an extensive range of spray tan products on offer, TechnoTan is the ultimate destination for all of your spray tan needs. We offer a full range of tanning accessories to grow your business and support your salon.